Time for this week’s round up! 64. Hotel room in Windsor – there for a dance competition. My sister updating Buzz. 65. Becky, Vincent, Emma and Ethan. Vincent was a judge, and taught a hiphop workshop. He also placed second in year two of the Canadian So You Think You Can Dance. I voted for him. He was my favourite. 66. Ethan’s face when he saw his new bike for his 10th birthday. 67. Yay for playing outside in some sunshine!! 69. My babies cuddled up and playing together! 70. More snowstorms/power outages/road closers. Will spring ever come?!? 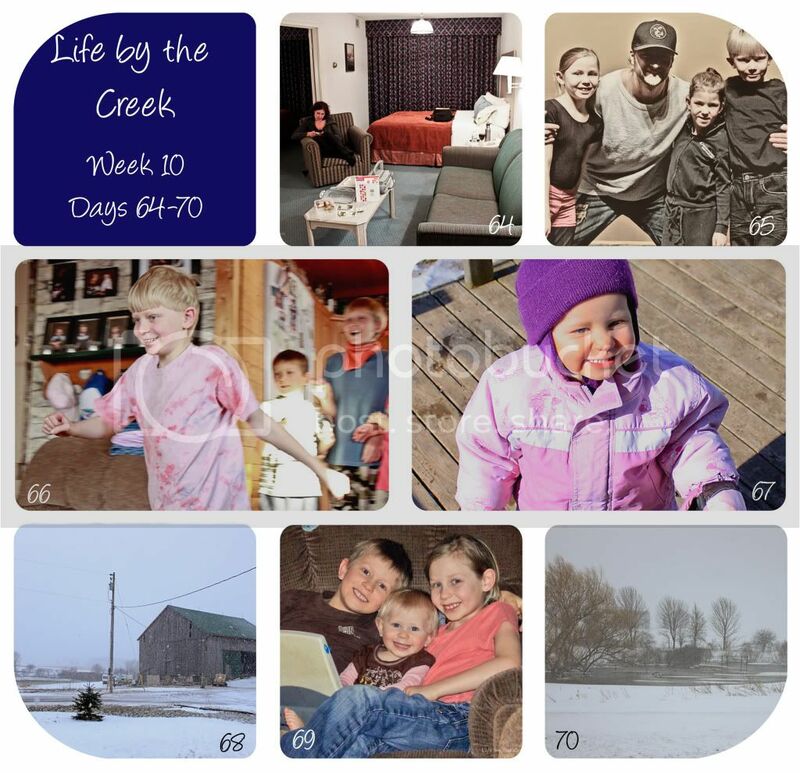 And that’s how our week went around the creek. Visit Sarah to see some more 365’s. I hope Spring comes soon! I'm starting to get the "Spring Cleaning" itch! Great collage. Looks like a fun week. I'm ready for spring too! I hope you get some warmer weather soon! It looks so cold! Sorry about the snow. brrr... love the photo of them sitting on the couch. So cute! Nice pictures! Too bad the crappy lighting made Vincent's face dark, eh? Love, LOVE Ethan's face. Made me smile.